Rinse and drain beans twice. Set aside. Add olive oil to a skillet over medium-high heat. Add 1/3 of onion and 1 tablespoon of garlic, and sauté until the onion is translucent, about 4 minutes. Add ground turkey and ground pork to skillet. Reduce heat to medium, and cook until meat is thoroughly browned, about 15 minutes, stirring occasionally. 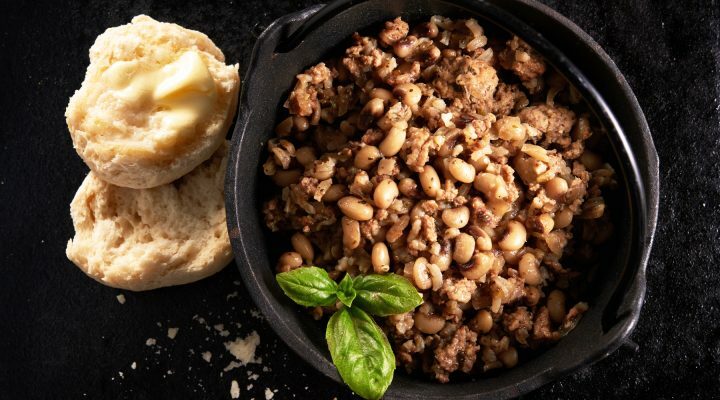 Add blackeye peas to a large Dutch oven, preferably cast iron, and cover with 2 1/2 inches of water. To the large Dutch oven, add meat mixture, remaining onion and garlic, Worcestershire, Creole seasoning to taste, basil, wine and rice. Bring to a boil, reduce heat to medium, and simmer until peas are soft, about 1 1/2 to 2 hours, stirring occasionally. Add additional water if necessary.